James Abram Garfield (November 19, 1831  September 19, 1881) was the 20th President of the United States , serving from March 4, 1881, until his assassination later that year. Garfield had served nine terms in the House of Representatives, and had been elected to the Senate before his candidacy for the White House, though he declined the Senate seat once he was elected President. He is the only sitting House member to be elected president. Garfield was raised by his widowed mother in humble circumstances on an Ohio farm. He worked at various jobs, including on a canal boat, in his youth. Beginning at age 17, he attended several Ohio schools, then studied at Williams College in Williamstown, Massachusetts, graduating in 1856. A year later, Garfield entered politics as a Republican. He married Lucretia Rudolph in 1858, and served as a member of the Ohio State Senate (18591861). Garfield opposed Confederate secession, served as a major general in the Union Army during the American Civil War, and fought in the battles of Middle Creek, Shiloh, and Chickamauga. He was first elected to Congress in 1862 to represent Ohio’s 19th District. Throughout Garfield’s extended congressional service after the Civil War, he firmly supported the gold standard and gained a reputation as a skilled orator. Garfield initially agreed with Radical Republican views regarding Reconstruction, but later favored a moderate approach for civil rights enforcement for freedmen. At the 1880 Republican National Convention, Senator-elect Garfield attended as campaign manager for Secretary of the Treasury John Sherman, and gave the presidential nomination speech for him. When neither Sherman nor his rivals  Ulysses S. Grant and James G. Blaine  could get enough votes to secure the nomination, delegates chose Garfield as a compromise on the 36th ballot. In the 1880 presidential election, Garfield conducted a low-key front porch campaign, and narrowly defeated Democrat Winfield Scott Hancock. Garfield’s accomplishments as president included a resurgence of presidential authority against senatorial courtesy in executive appointments, energizing American naval power, and purging corruption in the Post Office, all during his extremely short time in office. Garfield made notable diplomatic and judiciary appointments, including a U.S. Supreme Court justice. He enhanced the powers of the presidency when he defied the powerful New York senator Roscoe Conkling by appointing William H. Robertson to the lucrative post of Collector of the Port of New York, starting a fracas that ended with Robertson’s confirmation and Conkling’s resignation from the Senate. Garfield advocated agricultural technology, an educated electorate, and civil rights for African Americans. He also proposed substantial civil service reform, eventually passed by Congress in 1883 and signed into law by his successor, Chester A. Arthur, as the Pendleton Civil Service Reform Act. On July 2, 1881, he was shot at the Baltimore and Potomac Railroad Station in Washington D.C. by Charles J. Guiteau, a lawyer and writer with a grievance. The wound was not immediately fatal for Garfield, but his doctors’ uncleaned and unprotected hands are said to have led to infection that caused his death on September 19. Guiteau was convicted of the murder and was executed in June 1882; he tried to name his crime as simple assault by blaming the doctors for Garfield’s death. With his term cut short by his death after only 200 days, and much of it spent in ill health trying to recover from the attack, Garfield is little-remembered for other than his assassination. Historians often forgo listing him in rankings of U.S. presidents due to the short length of his presidency. 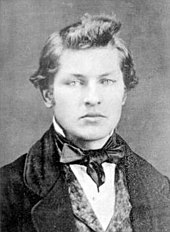 James Garfield was born the youngest of five children on November 19, 1831, in a log cabin in Orange Township, now Moreland Hills, Ohio. Orange Township was located in the Western Reserve, and like many who settled there, Garfield’s ancestors were from New England, his ancestor, Edward Garfield immigrating from Hillmorton, Warwickshire, England, to Massachusetts in around 1630. James’ father Abram had been born in Worcester, New York, and came to Ohio to woo his childhood sweetheart, Mehitabel Ballou, only to find her married. He instead wed her sister Eliza, who had been born in New Hampshire. James was named for an older brother, dead in infancy. In early 1833, Abram and Eliza Garfield joined the Church of Christ, a decision that would help shape their youngest son’s life. Abram Garfield died later that year; his son was raised in poverty in a household led by the strong-willed Eliza. James was her favorite child, and the two remained close for the rest of his life. Eliza Garfield remarried in 1842, but soon left her second husband, Warren Belden (possibly Alfred Belden), and a then-scandalous divorce was awarded against her in 1850. James took his mother’s side and when Belden died in 1880, noted the fact in his diary with satisfaction. Garfield enjoyed his mother’s stories about his ancestry, especially his Welsh great-great-grandfathers and his ancestor who served as a knight of Caerffili Castle. Poor and fatherless, Garfield was mocked by his fellow boys, and throughout his life was very sensitive to slights. He escaped through reading, devouring all the books he could find. He left home at age 16 in 1847. Rejected by the only ship in port in Cleveland, Garfield instead found work on a canal boat, responsible for managing the mules that pulled it. This labor would be used to good effect by Horatio Alger, who penned Garfield’s campaign biography in 1880. At Geauga Academy, which he attended from 1848 to 1850, Garfield learned academic subjects he had not previously had time for. He shone as a student, and was especially interested in languages and elocution. He began to appreciate the power a speaker had over an audience, writing that the speaker’s platform “creates some excitement. I love agitation and investigation and glory in defending unpopular truth against popular error.” Geauga was co-educational, and Garfield was attracted to one of his fellow students, Lucretia Rudolph, whom he later married. To support himself at Geauga, he worked as a carpenter’s assistant and as a teacher. The need to go from town to town to find a place as a teacher disgusted Garfield, and he thereafter developed a dislike of what he called “place-seeking”, which became, he said, “the law of my life.” In later years, he would astound his friends by letting positions pass that could have been his with a little politicking. Garfield had attended church more to please his mother than to worship God, but in his late teens underwent a religious awakening, and attended many camp meetings, at one of which he was born again. The next day, March 4, 1850, he was baptized into the Disciples by being submerged in the icy waters of the Chagrin River. After leaving Geauga, Garfield worked for a year at various jobs, including teaching. Finding that some New Englanders worked their way through college, Garfield determined to do the same, and first sought a school that could prepare him for the entrance examinations. From 1851 to 1854, he attended the Western Reserve Eclectic Institute (later named Hiram College) in Hiram, Ohio, a school run by the Disciples. While there, he was most interested in the study of Greek and Latin, but was inclined to learn about and discuss any new thing he encountered. Securing a position on entry as janitor, he was hired to teach while still a student. Lucretia Rudolph had also enrolled at the Institute, and Garfield wooed her while teaching her Greek. He developed a regular preaching circuit at neighboring churches, in some cases earning a gold dollar per service. By 1854, Garfield had learned all the Institute could teach him and was a full-time teacher. Garfield then enrolled at Williams College in Williamstown, Massachusetts, as a third-year student, given credit for two years’ study at the Institute after passing a cursory examination. Garfield was impressed with the college president, Mark Hopkins, who had responded warmly to Garfield’s letter inquiring about admission. He said of Hopkins, “The ideal college is Mark Hopkins on one end of a log with a student on the other.” Hopkins later stated about Garfield in his student days, “There was a large general capacity applicable to any subject. There was no pretense of genius, or alternation of spasmodic effort, but a satisfactory accomplishment in all directions.” After his first term, Garfield was hired to teach penmanship to the students of nearby Pownal, Vermont, a post whose previous incumbent was Chester A. Arthur. Local Republican Party leaders invited Garfield to enter politics upon the death of Cyrus Prentiss, the presumptive nominee for the local state senate seat. He was nominated by the party convention on the sixth ballot, and was elected, serving until 1861. Garfield’s major effort in the state senate was a bill providing for Ohio’s first geological survey to measure its mineral resources, though it failed. After Abraham Lincoln‘s election as president, several Southern states announced their secession from the Union to form a new government, the Confederate States of America. Garfield read military texts while anxiously awaiting the war effort, which he regarded as a holy crusade against the Slave Power. In April 1861, the rebels bombarded Fort Sumter, one of the last federal outposts in the South, beginning the Civil War. Although he had no military training, Garfield knew that his place was in the Union Army. At Governor William Dennison’s request, Garfield deferred his military ambitions to remain in the legislature, where he helped appropriate the funds to raise and equip Ohio’s volunteer regiments. Afterward, the legislature adjourned and Garfield spent the spring and early summer on a speaking tour of northeastern Ohio, encouraging enlistment in the new regiments. Following a trip to Illinois to purchase muskets, Garfield returned to Ohio and, in August 1861, received a commission as a colonel in the 42nd Ohio Infantry regiment. The 42nd Ohio existed only on paper, so Garfield’s first task was to fill its ranks. He did so quickly, recruiting many of his neighbors and former students. The regiment traveled to Camp Chase, outside Columbus, Ohio, to complete training. In December, Garfield was ordered to bring the 42nd to Kentucky, where they joined the Army of the Ohio under Brigadier General Don Carlos Buell. Buell quickly assigned Garfield the task of driving Confederate forces out of eastern Kentucky, giving him the 18th Brigade for the campaign, which, besides his own 42nd, included the 40th Ohio Infantry, two Kentucky infantry regiments and two cavalry units. They departed Catlettsburg, Kentucky, in mid-December, advancing through the valley of the Big Sandy River. The march was uneventful until Union forces reached Paintsville, Kentucky, on January 6, 1862, where Garfield’s cavalry engaged the rebels at Jenny’s Creek. Confederate troops under Brigadier General Humphrey Marshall held the town in numbers roughly equal to Garfield’s own, but Garfield positioned his troops so as to deceive Marshall into believing that rebel forces were outnumbered. Marshall ordered his troops to withdraw to the forks of Middle Creek, on the road to Virginia; Garfield ordered his troops to pursue the Confederates. They attacked the rebel positions on January 9, 1862, in the Battle of Middle Creek, the only pitched battle Garfield personally commanded. At the end of the fighting, the Confederates withdrew from the field, and Garfield sent his troops to Prestonsburg to reprovision. In recognition of his success, Garfield was promoted to brigadier general, at the age of 30. After Marshall’s retreat, Garfield’s command was the sole remaining Union force in eastern Kentucky, and he announced that any men who had fought for the Confederacy would be granted amnesty if they returned to their homes and lived peaceably and remained loyal to the Union. The proclamation was surprisingly lenient, as Garfield now believed the war was a crusade for eradication of slavery. Following a brief skirmish at Pound Gap, the last rebel units in the area were outflanked, and they retreated to Virginia. Garfield’s promotion gave him command of the 20th Brigade of the Army of the Ohio, which was ordered in early 1862 to join Major General Ulysses S. Grant‘s forces as they advanced on Corinth, Mississippi. Before the 20th Brigade arrived, however, Confederate forces under General Albert Sidney Johnston surprised Grant’s men in their camps, driving them back. Garfield’s troops got word of the battle and advanced quickly, joining the rest of the army on the second day to drive the Confederates back across the field and into retreat. The action, later known as the Battle of Shiloh, was the bloodiest of the war to date; Garfield was exposed to fire for much of the day, but emerged uninjured. Major General Henry W. Halleck, Grant’s superior, took charge of the combined armies and advanced ponderously toward Corinth; when they arrived, the Confederates had fled. That summer Garfield suffered from jaundice and significant weight loss. He was forced to return home, where his wife nursed him back to health. While he was home, Garfield’s friends worked to gain him the Republican nomination for Congress, although he refused to politick with the delegates. He returned to military duty that autumn and went to Washington to await his next assignment. During this period of idleness, a rumor of an extra-marital affair caused friction in the Garfield marriage until Lucretia eventually chose to overlook it. Garfield repeatedly received tentative assignments that were quickly withdrawn, to his frustration. In the meantime, he served on the court-martial of Fitz John Porter for his tardiness at the Second Battle of Bull Run. He was convinced of Porter’s guilt, and voted with his fellow generals to convict. The trial lasted almost two months, from November 1862 to January 1863, and by the end of it, Garfield had at last procured an assignment as Chief of Staff to Major General William S. Rosecrans. The position of Chief of Staff for a general was usually held by a more junior officer, but Garfield’s influence with Rosecrans was greater than usual, with duties extending beyond mere communication of orders to duties that involved actual management of his Army of the Cumberland. Rosecrans had a voracious appetite for conversation, especially when he was unable to sleep; in Garfield, he found “the first well read person in the Army” and the ideal candidate for discussions that ran deep into the night. The two became close in spite of Garfield’s being twelve years junior to Rosecrans, and their talks covered all topics, especially religion; Rosecrans, who had converted from Methodism to Roman Catholicism, succeeded in softening Garfield’s view of his faith. Garfield recommended that Rosecrans replace wing commanders Alexander McCook and Thomas Crittenden, whom he believed ineffective, but Rosecrans ignored the suggestions. With Rosecrans, Garfield devised the Tullahoma Campaign to pursue and trap Confederate General Braxton Bragg in Tullahoma. After initial Union success, Bragg retreated toward Chattanooga, where Rosecrans stalled and requested more troops and supplies. Garfield argued for an immediate advance, in line with demands from Halleck and Lincoln. After a council of war and lengthy deliberations, Rosecrans agreed to attack. At the ensuing Battle of Chickamauga on September 19 and 20, 1863, confusion among the wing commanders over Rosecrans’s orders created a gap in the lines, resulting in a rout of the right flank. Rosecrans concluded that the battle was lost and fell back on Chattanooga to establish a defensive line. Garfield, however, thought that part of the army had held and, with Rosecrans’s approval, headed across Missionary Ridge to survey the scene. Garfield’s hunch was correct. His ride became legendary, while Rosecrans’ error reignited criticism about his leadership. While Rosecrans’s army had avoided disaster, they were stranded in Chattanooga, surrounded by Bragg’s army. Garfield sent a telegram to Secretary of War Edwin M. Stanton alerting Washington to the need for reinforcements to avoid annihilation, and Lincoln and Halleck delivered 20,000 troops by rail within nine days. 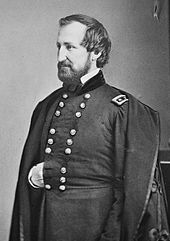 In the meantime, Grant was promoted to command of the western armies, and quickly replaced Rosecrans with George H. Thomas. Garfield was ordered to report to Washington, where he was promoted to major general, a commission he would resign before taking a seat in the House of Representatives. According to historian Jean Edward Smith, Grant and Garfield had a “guarded relationship”, since Grant promoted Thomas to command of the Army of the Cumberland, rather than Garfield, after Rosecrans was dismissed. 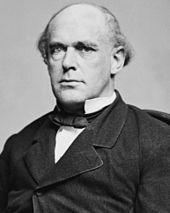 Salmon P. Chase was Garfield’s ally until Andrew Johnson’s impeachment trial. While serving in the army in early 1862, Garfield was approached by friends about running for Congress from Ohio’s newly redrawn, heavily Republican 19th district. He was worried that he and other state-appointed generals would get obscure assignments, and running for Congress would allow him to resume his political career. The fact that the new Congress would not hold its first regular session until December 1863 would allow him to continue his war service for a time. Home on medical leave, he refused to campaign for the nomination, leaving that to political managers who secured it at the local convention in September 1862, on the eighth ballot. In October, he defeated D.B. Woods by a two-to-one margin in the general election for a seat in the 38th Congress. Garfield not only favored abolition of slavery, but believed that the leaders of the rebellion had forfeited their constitutional rights. He supported the confiscation of southern plantations and even exile or execution of rebellion leaders as a means to ensure the permanent destruction of slavery. Garfield felt Congress was obliged “to determine what legislation is necessary to secure equal justice to all loyal persons, without regard to color.” Garfield was more supportive of Lincoln when Lincoln took action against slavery. Early in his tenure, he differed from his party on several issues; his was the solitary Republican vote to terminate the use of bounties in recruiting. Some financially able recruits had used the bounty system to buy their way out of service (called commutation), which Garfield considered reprehensible. Garfield gave a speech pointing out the flaws in the existing conscription law: that of 300,000 called upon to enlist, barely 10,000 had, the remainder claiming exemption or providing money or a substitute. Lincoln appeared before the Military Affairs committee on which Garfield served, demanding a more effective bill; even if it cost him re-election, Lincoln was confident he could win the war before his term expired. After many false starts, Garfield, with the support of Lincoln, procured the passage of a conscription bill that excluded commutation. Under Chase’s influence, Garfield became a staunch proponent of a dollar backed by a gold standard, and was therefore a strong opponent of the “greenback“; he regretted very much, but understood, the necessity for suspension of payment in gold or silver during the emergency presented by the Civil War. Garfield voted with the Radical Republicans in passing the WadeDavis Bill, designed to give Congress more authority over Reconstruction, but it was defeated by Lincoln’s pocket veto. Garfield did not consider Lincoln particularly worthy of re-election, but no viable alternative seemed available. “He will probably be the man, though I think we could do better.” The Ohioan attended the party convention and promoted Rosecrans as Lincoln’s running mate, but delegates chose Military Governor of Tennessee Andrew Johnson. Both Lincoln and Garfield were re-elected. By then, Chase had left the Cabinet and had been appointed Chief Justice, and his relations with Garfield became more distant. The conflict between the branches of government was the major issue of the 1866 campaign, with Johnson taking to the campaign trail in a Swing Around the Circle and Garfield facing opposition within his party in his home district. With the South still disenfranchised and Northern public opinion behind them, the Republicans gained a two-thirds majority in both houses of Congress. Garfield, having overcome his challengers at his district nominating convention, was easily re-elected. Garfield opposed the initial talk of impeaching President Johnson when Congress convened in December 1866. However, he supported legislation to limit Johnson’s powers, such as the Tenure of Office Act, which restricted Johnson in removing presidential appointees. Distracted by committee duties, he rarely spoke in connection with these bills, but was a loyal Republican vote against Johnson. Due to a court case, he was absent on the day in April 1868 when the House impeached Johnson, but soon gave a speech aligning himself with Thaddeus Stevens and others who sought Johnson’s removal. When the president was acquitted in trial before the Senate, Garfield was shocked, and blamed the outcome of the trial on its presiding officer, Chief Justice Chase, his onetime mentor. By the time Ulysses S. Grant succeeded Johnson in 1869, Garfield had moved away from the remaining radicals (Stevens, their leader, had died in 1868). He hailed the ratification of the 15th Amendment in 1870 as a triumph, and he favored the re-admission of Georgia to the Union as a matter of right, not politics. In 1871, Garfield opposed passage of the Ku Klux Klan Act, saying, “I have never been more perplexed by a piece of legislation.” He was torn between his indignation at “these terrorists” and his concern for the freedoms endangered by the power the bill gave to the president to enforce the act through suspension of habeas corpus. Throughout his political career, Garfield favored the gold standard and decried attempts to increase the money supply through the issuance of paper money not backed by gold, and later, through the free and unlimited coinage of silver. In 1865, Garfield was placed on the House Ways and Means Committee, a long-awaited opportunity to focus on financial and economic issues. He reprised his opposition to the greenback, saying, “Any party which commits itself to paper money will go down amid the general disaster, covered with the curses of a ruined people.” In 1868 Garfield gave a two-hour speech on currency in the House, which was widely applauded as his best oratory to that point; in it he advocated a gradual resumption of specie payments, that is, the government paying out silver and gold, rather than paper money that could not be redeemed. Garfield was not at all enthused about the re-election of President Grant in 1872until Horace Greeley, who emerged as the candidate of the Democrats and Liberal Republicans, became the only serious alternative. Garfield opined, “I would say Grant was not fit to be nominated and Greeley is not fit to be elected.” Both Grant and Garfield won overwhelming re-election victories. The story broke in July 1872, in the middle of the presidential campaign. Among those named were Vice President (and former House Speaker) Schuyler Colfax, Grant’s second-term running mate (Massachusetts Senator Henry Wilson), Speaker James G. Blaine of Maine, and Garfield. Greeley had little luck taking advantage of the scandal. When Congress reconvened after the election, Blaine, seeking to clear his name, demanded a House investigation. Evidence before the special committee exonerated Blaine. Garfield had stated, in September 1872, that Ames had offered him stock, but he had repeatedly refused it. Testifying before the committee in January, Ames alleged that he had offered Garfield ten shares of stock at par value, but that Garfield had never taken the shares, or paid for them. A year had passed, from 1867 to 1868, before Garfield had finally refused it. Garfield, appearing before the committee on January 14, 1873, confirmed much of this. Ames testified several weeks later that Garfield agreed to take the stock on credit, and that it was paid for by the company’s huge dividends. The two men differed over a sum of some $300 that Garfield received and later paid back, with Garfield deeming it a loan and Ames a dividend. Another issue that caused Garfield trouble in his 1874 re-election bid was the so-called “Salary Grab” of 1873, which increased the compensation for members of Congress by 50 percent, retroactive to 1871. Garfield was responsible, as Appropriations Committee chairman, for shepherding the legislative appropriations bill through the House; during the debate in February 1873, Massachusetts Representative Benjamin Butler offered the increase as an amendment, and despite Garfield’s opposition, it passed the House and eventually became law. The law was very popular in the House, as almost half the members were lame ducks, but the public was outraged, and many of Garfield’s constituents blamed him, though he refused to accept the increase. In what was a bad year for Republicans, who lost control of the House for the first time since the Civil War, Garfield had his closest congressional election, winning with only 57 percent of the vote. As the 1876 presidential election approached, Garfield was loyal to the candidacy of Senator Blaine, and fought for the former Speaker’s nomination at the 1876 Republican National Convention in Cincinnati. When it became clear, after six ballots, that Blaine could not prevail, the convention nominated Ohio Governor Rutherford B. Hayes. Although Garfield had supported Blaine, he had kept good relations with Hayes, and wholeheartedly supported the governor. Garfield had hoped to retire from politics after his term expired to devote himself full-time to the practice of law, but to help his party, he sought re-election, and won it easily that October. Any celebration was short lived, as Garfield’s youngest son, Neddie, fell ill with whooping cough shortly after the congressional election, and soon died. When Hayes appeared to have lost the presidential election the following month to Democrat Samuel Tilden, the Republicans launched efforts to reverse the result in Southern states where they held the governorship: South Carolina, Louisiana, and Florida. If Hayes won all three states, he would take the election by a single electoral vote. Grant asked Garfield to serve as a “neutral observer” in the recount in Louisiana. The observers soon recommended to the state electoral commissions that Hayes be declared the winnerGarfield recommended that the entire vote of West Feliciana Parish, which had given Tilden a sizable majority, be thrown out. The Republican governors of the three states certified that Hayes had won their states, to the outrage of Democrats, who had the state legislatures submit rival returns, and threatened to prevent the counting of the electoral voteunder the Constitution, Congress is the final arbiter of the election. Congress then passed a bill establishing the Electoral Commission, to determine the winner. Although he opposed the Commission, feeling that Congress should count the vote and proclaim Hayes victorious, Garfield was appointed to it over the objections of Democrats that he was too partisan. Hayes emerged the victor by a Commission vote of 8 to 7, with all eight votes being cast by Republican politicians or appointees of that party to the Supreme Court. As part of the deal whereby they recognized Hayes as president, Southern Democrats secured the removal of federal troops from the South, ending Reconstruction. Although a Senate seat would be disposed of by the Ohio General Assembly after the resignation of John Sherman to become Treasury Secretary, Hayes needed Garfield’s expertise to protect him from the agenda of a hostile Congress, and asked him not to seek it. Garfield, as the president’s key legislator, gained considerable prestige and respect for his role. When Congress debated what became the Bland-Allison Act, to have the government purchase large quantities of silver and strike it into fully legal tender dollar coins, Garfield fought against this deviation from the gold standard, but it was enacted over Hayes’s veto in February 1878. Garfield during this time purchased the property in Mentor that reporters later dubbed Lawnfield, and from which he would conduct the first successful front porch campaign for the presidency. Hayes suggested that Garfield run for governor in 1879, seeing that as a road that would likely put Garfield in the White House. Garfield preferred to seek election as senator, and devoted his efforts to seeing that Republicans won the 1879 election for the General Assembly, with the likely Democratic candidate the incumbent, Allen G. Thurman. The Republicans swept the legislative elections. Rivals were spoken of for the seat, such as Secretary Sherman, but he had presidential ambitions (for which he sought Garfield’s support), and other candidates fell by the wayside. Garfield was elected to the Senate by the General Assembly in January 1880, though his term was not to begin until March 4, 1881. Garfield was one of three attorneys who argued for the petitioners in the landmark Supreme Court case Ex parte Milligan in 1866. His clients were pro-Confederate northern men who had been found guilty and sentenced to death by a military court for treasonous activities. The case turned on whether the defendants should instead have been tried by a civilian court, and resulted in a ruling that civilians could not be tried before military tribunals while the civil courts were operating. The oral argument was Garfield’s first court appearance. Jeremiah Black had taken him in as a junior partner a year before, and assigned the case to him in light of his highly regarded oratory skills. With the result, Garfield instantly achieved a reputation as a preeminent appellate lawyer. During Grant’s first term, discontented with public service, Garfield pursued opportunities in the law, but declined a partnership offer when told his prospective partner was of “intemperate and licentious” reputation. In 1873, after the death of Chase, Garfield appealed to Grant to appoint Justice Noah H. Swayne as Chief Justice. Grant, however, appointed Morrison R. Waite. Garfield thought the land grants given to expanding railroads was an unjust practice. He also opposed some monopolistic practices by corporations, as well as the power sought by workers’ unions. Garfield supported the proposed establishment of the United States civil service as a means of ridding officials of the annoyance of aggressive office seekers. He especially wished to eliminate the common practice whereby government workers, in exchange for their positions, were forced to kick back a percentage of their wages as political contributions. Following Grant’s defeat for the nomination Puck magazine satirized Robert E. Lee‘s surrender to him at Appomattox by depicting Grant giving up his sword to Garfield. Having just been elected to the Senate with Sherman’s support, Garfield entered the 1880 campaign season committed to Sherman as his choice for the Republican presidential nominee. Even before the convention began, however, a few Republicans, including Wharton Barker of Philadelphia, thought Garfield the best choice for the nomination. Garfield denied any interest in the position, but the attention was enough to make Sherman suspicious of his lieutenant’s ambitions. Besides Sherman, the early favorites for the nomination were Blaine and former president Grant, but several other candidates attracted delegates as well. 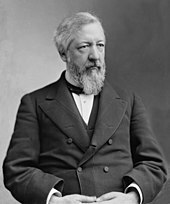 As the convention began, Senator Roscoe Conkling of New York, the floor leader for the Grant forces (known as the Stalwart faction), proposed that the delegates pledge to support the eventual nominee in the general election. When three West Virginia delegates declined to be so bound, Conkling sought to expel them from the convention. Garfield rose to defend the men, giving a passionate speech in defense of their right to reserve judgment. The crowd turned against Conkling, and he withdrew the motion. The performance delighted Garfield’s boosters, who now believed more than ever that he was the only man who could attract a majority of the delegates’ votes. After speeches in favor of the other front-runners, Garfield rose to place Sherman’s name in nomination; his nominating speech was well-received, but the delegates mustered little excitement for the idea of Sherman as the next president. The first ballot showed Grant leading with 304 votes and Blaine in second with 284; Sherman’s 93 placed him in a distant third. Subsequent ballots quickly demonstrated a deadlock between the Grant and Blaine forces, with neither having the 379 votes needed for nomination.Jeremiah McLain Rusk, a member of the Wisconsin delegation, and Benjamin Harrison, an Indiana delegate, sought to break the deadlock by shifting a few of the anti-Grant votes to a dark horse candidateGarfield. Garfield gained 50 votes on the 35th ballot, and the stampede began. Garfield protested to the other members of his Ohio delegation that he had not sought the nomination and had never intended to betray Sherman, but they overruled his objections and cast their ballots for him. In the next round of voting, nearly all of the Sherman and Blaine delegates shifted their support to Garfield, giving him 399 votes and the Republican nomination. Most of the Grant forces backed the former president to the end, creating a disgruntled Stalwart minority in the party. To obtain that faction’s support for the ticket, former New York customs collector Chester A. Arthur, a member of Conkling’s political machine, was chosen as the vice-presidential nominee. Practical differences between the candidates were few, and Republicans began the campaign with the familiar theme of waving the bloody shirt: reminding Northern voters that the Democratic Party was responsible for secession and four years of civil war, and that if Democrats held power they would reverse the gains of that war, dishonor Union veterans, and pay Confederate veterans pensions out of the federal treasury. With fifteen years having passed since the end of the war, and Union generals at the head of both tickets, the bloody shirt was of diminishing value in exciting the voters. With a few months to go before the election, the Republicans switched tactics to emphasize the tariff. Seizing on the Democratic platform’s call for a “tariff for revenue only”, Republicans told Northern workers that a Hancock presidency would weaken the tariff protection that kept them in good jobs. Hancock made the situation worse when, attempting to strike a moderate stance, he said, “The tariff question is a local question.” The ploy proved effective in uniting the North behind Garfield. In the end, fewer than two thousand votes, of the more than 9.2 million popular votes cast, separated the two candidates, but in the Electoral College Garfield had an easy victory over Hancock, 214 to 155. Between his election and his inauguration, Garfield was occupied with assembling a cabinet that would establish peace between Conkling’s and Blaine’s warring factions. Blaine’s delegates had provided much of the support for Garfield’s nomination, and the Maine senator received the place of honor: Secretary of State. Blaine was not only the president’s closest advisor, he was obsessed with knowing all that took place in the White House, and was even said to have spies posted there in his absence. Garfield nominated William Windom of Minnesota as Secretary of the Treasury, William H. Hunt of Louisiana as Secretary of the Navy, Robert Todd Lincoln as Secretary of War, and Samuel J. Kirkwood of Iowa as Secretary of the Interior. New York was represented by Thomas Lemuel James as Postmaster General. Garfield appointed Pennsylvania’s Wayne MacVeagh, an adversary of Blaine’s, as Attorney General. Blaine tried to sabotage the appointment by convincing Garfield to name an opponent of MacVeagh, William E. Chandler, as Solicitor General under MacVeagh. Only Chandler’s rejection by the Senate forestalled MacVeagh’s resignation over the matter. Garfield’s appointment of James infuriated Conkling, a factional opponent of the Postmaster General, who demanded a compensatory appointment for his faction, such as the position of Secretary of the Treasury. The resulting squabble occupied much of Garfield’s brief presidency. The feud with Conkling reached a climax when the president, at Blaine’s instigation, nominated Conkling’s enemy, Judge William H. Robertson, to be Collector of the Port of New York. This was one of the prize patronage positions below cabinet level, and was then held by Edwin A. Merritt. Conkling raised the time-honored principle of senatorial courtesy in an attempt to defeat the nomination, to no avail. Garfield, who believed the practice was corrupt, would not back down and threatened to withdraw all nominations unless Robertson was confirmed, intending to “settle the question whether the President is registering clerk of the Senate or the Executive of the United States.” Ultimately, Conkling and his New York colleague, Senator Thomas C. Platt, resigned their Senate seats to seek vindication, but found only further humiliation when the New York legislature elected others in their places. Robertson was confirmed as Collector and Garfield’s victory was clear. To Blaine’s chagrin, the victorious Garfield returned to his goal of balancing the interests of party factions, and nominated a number of Conkling’s Stalwart friends to offices. Corruption in the post office also cried out for reform. In April 1880, there had been a congressional investigation into corruption in the Post Office Department, in which profiteering rings allegedly stole millions of dollars, securing bogus mail contracts on star routes. After obtaining contracts with the lowest bid, costs to run the mail routes would be escalated and profits would be divided among ring members. That year, Hayes stopped the implementation of any new star route contracts. Shortly after taking office, Garfield received information from Attorney General MacVeagh and Postmaster General James of postal corruption by an alleged star route ringleader, Second Assistant Postmaster-General Thomas J. Brady. Garfield demanded Brady’s resignation and ordered prosecutions that would end in trials for conspiracy. When told that his party, including his own campaign manager, Stephen W. Dorsey, was involved, Garfield directed MacVeagh and James to root out the corruption in the Post Office Department “to the bone”, regardless of where it might lead. Brady resigned and was eventually indicted for conspiracy. After two “star route” ring trials in 1882 and 1883, the jury found Brady not guilty. Garfield believed that the key to improving the state of African American civil rights would be found in education aided by the federal government. During Reconstruction, freedmen had gained citizenship and suffrage that enabled them to participate in government, but Garfield believed their rights were being eroded by Southern white resistance and illiteracy, and was concerned that blacks would become America’s permanent “peasantry.” He answered by proposing a “universal” education system funded by the federal government. Congress and the northern white public, however, had lost interest in African-American rights, and federal funding for universal education did not find support in Congress during Garfield’s term. Garfield also worked to appoint several African Americans to prominent positions: Frederick Douglass, recorder of deeds in Washington; Robert Elliot, special agent to the Treasury; John M. Langston, Haitian minister; and Blanche K. Bruce, register to the Treasury. Garfield believed that Southern support for the Republican party could be gained by “commercial and industrial” interests rather than race issues and began to reverse Hayes’s policy of conciliating Southern Democrats. He appointed William H. Hunt, a carpetbagger Republican from Louisiana, as Secretary of the Navy. To break the hold of the resurgent Democratic Party in the Solid South, Garfield took patronage advice from Virginia Senator William Mahone of the biracial independent Readjuster Party, hoping to add the independents’ strength to the Republicans’ there. Entering the presidency, Garfield had little foreign policy experience, so he leaned heavily on Blaine. Blaine, a former protectionist, now agreed with Garfield on the need to promote freer trade, especially within the Western Hemisphere. Their reasons were twofold: firstly, Garfield and Blaine believed that increasing trade with Latin America would be the best way to keep Great Britain from dominating the region. Secondly, by encouraging exports, they believed they could increase American prosperity. Garfield authorized Blaine to call for a Pan-American conference in 1882 to mediate disputes among the Latin American nations and to serve as a forum for talks on increasing trade. At the same time, they hoped to negotiate a peace in the War of the Pacific then being fought by Bolivia, Chile, and Peru. Blaine favored a resolution that would not result in Peru yielding any territory, but Chile, which by 1881 had occupied the Peruvian capital, Lima, rejected any settlement that restored the previous status quo. Garfield sought to expand American influence in other areas, calling for renegotiation of the Clayton-Bulwer Treaty to allow the United States to construct a canal through Panama without British involvement, as well as attempting to reduce British influence in the strategically located Kingdom of Hawaii. Garfield’s and Blaine’s plans for the United States’ involvement in the world stretched even beyond the Western Hemisphere, as he sought commercial treaties with Korea and Madagascar. Garfield also considered enhancing the United States’ military strength abroad, asking Navy Secretary Hunt to investigate the condition of the navy with an eye toward expansion and modernization. In the end, these ambitious plans came to nothing after Garfield was assassinated. Nine countries had accepted invitations to the Pan-American conference, but the invitations were withdrawn in April 1882 after Blaine resigned from the cabinet and Arthur, Garfield’s successor, cancelled the conference. Naval reform continued under Arthur, if on a more modest scale than Garfield and Hunt had envisioned, ultimately ending in the construction of the Squadron of Evolution. 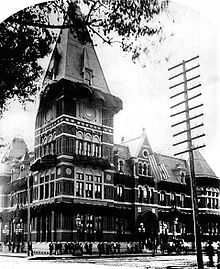 Garfield was shot by Charles J. Guiteau, a disgruntled office seeker, at the Baltimore and Potomac Railroad Station in Washington, D.C. on July 2, 1881. After eleven weeks of intensive and other care Garfield died in Elberon, New Jersey, the second of four Presidents to be assassinated, following Abraham Lincoln. Guiteau had followed various professions in his life, but in 1880 had determined to gain federal office by supporting what he expected would be the winning Republican ticket. He composed a speech, “Garfield vs. Hancock”, and got it printed by the Republican National Committee. One means of persuading the voters in that era was through orators expounding on the candidate’s merits, but with the Republicans seeking more famous men, Guiteau received few opportunities to speak. 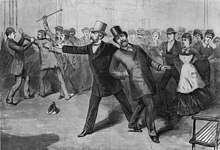 On one occasion, according to Kenneth D. Ackerman in his book about Garfield’s candidacy and assassination, Guiteau was unable to finish his speech due to nerves. Guiteau, who considered himself a Stalwart, deemed his contribution to Garfield’s victory sufficient to justify the position of consul in Paris, despite the fact he spoke no French, nor any foreign language. One of President Garfield’s more wearying duties was seeing office seekers, and he saw Guiteau at least once. White House officials suggested to Guiteau that he approach Blaine, as the consulship was within the Department of State. Blaine also saw the public regularly, and Guiteau became a regular at these sessions. Blaine, who had no intention of giving Guiteau a position he was unqualified for and had not earned, simply stated that the deadlock in the Senate over Robertson’s nomination made it impossible to consider the Paris consulship, which required Senate confirmation. Once the New York senators had resigned, and Robertson had been confirmed as Collector, Guiteau pressed his claim, and Blaine told him he would not receive the position. Guiteau came to believe he had lost the position because he was a Stalwart. The office-seeker decided that the only way to end the internecine warfare in the Republican Party was for Garfield to diethough he had nothing personal against the president. Arthur’s succession would restore peace, he felt, and lead to rewards for fellow Stalwarts, including Guiteau. The assassination of Abraham Lincoln was deemed a fluke due to the Civil War, and Garfield, like most people, saw no reason why the president should be guarded; Garfield’s movements and plans were often printed in the newspapers. Guiteau knew the president would leave Washington for a cooler climate on July 2, and made plans to kill him before then. He purchased a gun he thought would look good in a museum, and followed Garfield several times, but each time his plans were frustrated, or he lost his nerve. His opportunities dwindled to oneGarfield’s departure by train for New Jersey on the morning of July 2, 1881. Guiteau concealed himself by the ladies’ waiting room at the Sixth Street Station of the Baltimore and Potomac Railroad, from where Garfield was scheduled to depart. Most of Garfield’s cabinet planned to accompany him at least part of the way. Blaine, who was to remain in Washington, came to the station to see him off. The two men were deep in conversation and did not notice Guiteau before he took out his revolver and shot Garfield twice, once in the back and once in the arm. The time was 9:30 a.m. The assassin attempted to leave the station, but was quickly captured. As Blaine recognized him and Guiteau made no secret of why he had shot Garfield, the assassin’s motivation to benefit the Stalwarts reached many with the early news of the shooting, causing rage against that faction. Baltimore & Potomac Railroad Passenger Terminal in Washington where Garfield was shot July 2, 1881. Among those at the station was Robert Todd Lincoln, who sixteen years before had watched his father die from an assassin’s bullet. Garfield was taken on a mattress upstairs to a private office, where several doctors examined him, probing the wound with unwashed fingers. At his request, Garfield was taken back to the White House, and his wife, then in New Jersey, was sent for. Blaine sent word to Vice President Arthur in New York City, who received threats against his life because of his animosity toward Garfield and Guiteau’s statements. Over the next few days, Garfield made some improvement, as the nation viewed the news from the capital and prayed. Although he never stood again, he was able to sit up and write several times, and his recovery was viewed so positively that a steamer was fitted out as a seagoing hospital to aid with his convalescence. He was nourished on oatmeal porridge (which he detested) and milk from a cow on the White House lawn. When told that Indian chief Sitting Bull, a prisoner of the army, was starving, Garfield said, “Let him starve,” then, “Oh, no, send him my oatmeal.” X-radiation (or X-ray) usage, which likely would have helped the president’s physicians determine exactly where the bullet was lodged in his body, would not be invented for another fourteen years. Alexander Graham Bell tried to locate the bullet with a primitive metal detector; he was not successful. One means of keeping the president comfortable in Washington’s summer heat was one of the first successful air conditioning units: air that was propelled by fans over ice and then dried had reduced the temperature in the sickroom by 20 degrees Fahrenheit (11 degrees Celsius). Beginning on July 23, Garfield took a turn for the worse. His temperature increased to 104 °F (40 °C); doctors, concerned by an abscess that had developed by the wound, operated and inserted a drainage tube. This initially seemed to help, and Garfield, in his bed, was able to hold a brief cabinet meeting on July 29, though members were under orders from Bliss to discuss nothing that might excite Garfield. Doctors probed the abscess, which went into Garfield’s body, hoping to find the bullet; they most likely only made the infections worse. Garfield performed only one state act in August, signing an extradition paper. By the end of the month, the president was much more feeble than he had been, and his weight had decreased to 130 pounds (59 kg). On September 18, Garfield asked A. F. Rockwell, a friend, if he would have a place in history. Rockwell assured him he would, and told Garfield he had much work still before him. But his response was, “No, my work is done.” The following day, Garfield, by then also suffering from pneumonia and heart pains, marveled that he could not pick up a glass despite feeling well, and went to sleep without discomfort. He awoke that evening around 10:15 pm with great pain in his chest. The attendant watching him sent for Bliss, who found him unconscious. Despite efforts to revive him, Garfield never awoke, and died at 10:35 pm that evening. Learning from a reporter of Garfield’s death, Arthur took the presidential oath of office administered by New York Supreme Court Justice John R. Brady. Funeral, memorials and commemorations”]Garfield’s funeral train left Long Branch on the same special track that brought him there, traveling over tracks blanketed with flowers and past houses adorned with flags. His body was transported to the Capitol and then continued on to Cleveland for burial. More than 70,000 citizens, some waiting over three hours, passed by Garfield’s coffin as his body lay in state in Washington; later, on September 25, 1881, in Cleveland, more than 150,000a number equal to the entire population of that citylikewise paid their respects. His body was temporarily interred in a vault in Cleveland’s Lake View Cemetery until his permanent memorial was built. Memorials to Garfield were erected across the country. On April 10, 1882, seven months after Garfield’s death, the U.S. Post Office issued a postage stamp in his honor, the second stamp issued by the U.S. to honor an assassinated president. In 1884, sculptor Frank Happersberger completed a monument on the grounds of the San Francisco Conservatory of Flowers. In 1887, the James A. Garfield Monument was dedicated in Washington.Another monument, in Philadelphia’s Fairmount Park, was erected in 1896. In Victoria, Australia, Cannibal Creek was renamed Garfield in his honor. On May 19, 1890, Garfield’s body was permanently interred, with great solemnity and fanfare, in a mausoleum in Lake View Cemetery in Cleveland. Attending the dedication ceremonies were former president Hayes, President Benjamin Harrison, and future president William McKinley. Garfield’s Treasury Secretary, William Windom, also attended. Harrison said that Garfield was always a “student and instructor” and that his life works and death would “…continue to be instructive and inspiring incidents in American history.” Three panels on the monument display Garfield as a teacher, Union major general, and orator; another shows him taking the Presidential oath, and a fifth shows his body lying in state at the Capitol rotunda in Washington, D.C.
Garfield’s murder by a deranged office-seeker awakened public awareness of the need for civil service reform legislation. Senator George H. Pendleton, a Democrat from Ohio, launched a reform effort that resulted in the Pendleton Act in January 1883. This act reversed the “spoils system” where office seekers paid up or gave political service to obtain or keep federally appointed positions. Under the act, appointments were awarded on merit and competitive examination. To ensure the reform was implemented, Congress and Arthur established and funded the Civil Service Commission. The Pendleton Act, however, covered only 10% of federal government workers. For Arthur, previously known for having been a “veteran spoilsman,” civil service reform became his most noteworthy achievement. For a few years after his assassination, Garfield’s life story was seen as an exemplar of the American success storythat even the poorest boy might someday become President of the United States. Peskin noted that, “In mourning Garfield, Americans were not only honoring a president; they were paying tribute to a man whose life story embodied their own most cherished aspirations.” As the rivalry between Stalwarts and Half-Breeds faded from the scene in the late 1880s and after, so too did memories of Garfield. 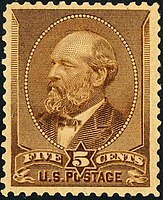 Beginning in 1882, the year after Garfield’s death, the U.S. Post Office began issuing postage stamps honoring the late President. Despite his short term as President, nine different issues were printed over the years. In the 1890s, Americans became disillusioned with politicians, and looked elsewhere for inspiration, focusing on industrialists, labor leaders, scientists, and others as their heroes. Increasingly, Garfield’s short time as president was forgotten.